I'm in the midst of a 30-day free trial for Amazon Fresh, and a couple people asked about it so I thought I'd post my experience so far. Amazon Fresh is home delivered groceries. Yes, order in your pajamas, and have groceries on your front porch. They started in their hometown of Seattle and have expanded to Los Angeles and San Francisco. Okay, stuff up front. I'm not paid by Amazon for this review, and anyone in the service area can get this free 30-day trial. I am, however, in the Amazon Affiliate program so if you buy books, subscriptions to Amazon Prime, and stuff via my Amazon link, I get a few cents. I'm on the fence about continuing the Amazon Fresh due to the price...but more on that later. My neighbor and I were chatting after the holidays about Amazon Fresh. It's so darn tempting! There are a bunch of people who have Amazon Prime and the OnTrac, UPS, FedEx and USPS trucks almost caused a traffic jam on the street during the holidays. We shop via computer. A lot. So, I thought I would give it a 30-day try! Amazon Fresh Basics: Your Amazon Prime membership goes from $79/year to $299/year. Grocery minimum is $35 per order. I can't live without Amazon Prime and sometimes I feel like I abuse it..."Oh, that $7 cable? Just order it on Prime and get it with free two-day shipping (often getting it in ONE day)." Anyway, the price difference is big and it's my biggest concern. First order: It was quite exciting to open the door around 5:30 am and see your groceries on the porch. Sure, it's totally lazy, but just let me have my moments in the morning. You get these large Amazon Fresh green bags with your order. The next time you order, you leave the bags out for the driver to pick up. When you order refrigerated items, they place them in a collapsible Styrofoam container with four frozen water bottles. This is ingenious! Amazon has a note saying the water is fresh and fine to drink later. The bag on the right has two Stryfoam containers broken down inside. The order was about $100. When you are ready to check out online, you get a grid of delivery options. You can choose "unattended" (leave on porch) or "attended" delivery (must be home to sign - alcohol purchases need attended delivery). You get to pick the time! 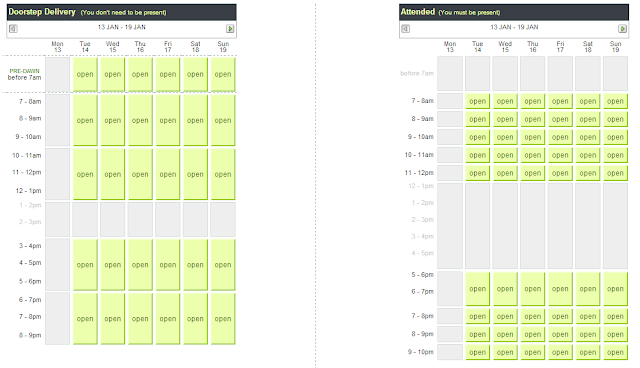 (unattended has 3 hours spans but attended delivery has one hour spaces). The times range from "pre-dawn - before 7 am" to 10 pm. Pretty convenient! 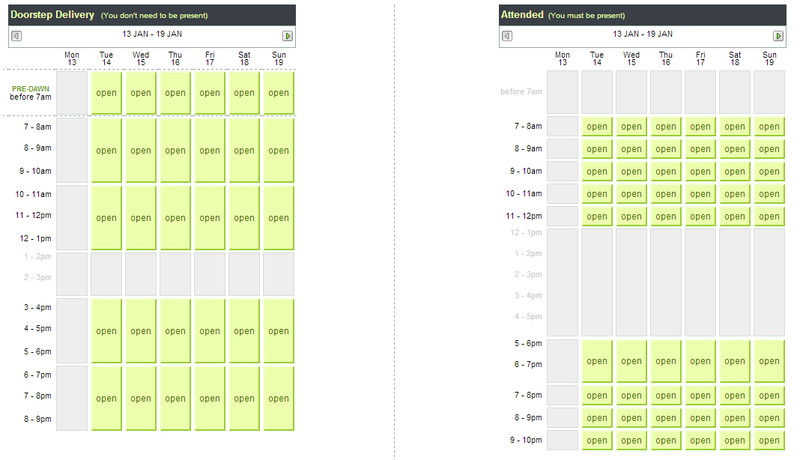 Also, the grid will tell you if you can't get a delivery time because one or more items isn't available. For instance, I wanted pre-dawn delivery and a lip balm was holding up the order. I could either remove the lip balm and get the time I wanted, or keep it in and pick a later time in the day. You can also leave the driver a tip. They suggest $4 and it's charged a few days after the delivery so you can adjust it if you wish. I went with the default $4 (the delivery guy wasn't hiking up stairs or anything difficult). Order #1 Issue - The Bananas. You can order bananas in two ways - ripe or green. I ordered ripe. They were placed in the large green back with a 12-pack of canned dog food (on the bottom). Also, there were three glass Martinelli apple cider bottles. And the bananas. So, in the packing, delivery and overall move to my house, the bottles fell on my bananas. They were a bit bruised. I ate them no problem, but I let Amazon know that I didn't think it was the wisest move to pack bottles with bananas. Within hours, they sent me an email saying they credited my account for the bananas and gave me a $30 credit for AmazonFresh (I didn't ask for that). I've ALWAYS had really good dealings with Amazon customer support and this was no different. This time, I tested buying something frozen (Kashi frozen meal) and it came in the collapsible Styrofoam container with packets of dry ice. If you wanted to get a fog machine going, you could have fun with this. :) But there is a warning notice, so if you have children, watch out for the dry ice because improper handling can burn. Cold stuff - refrigerated stuff comes with four (free) frozen water bottles. Order #3 (January 2014) This time I ordered a bunch of yogurt, laundry detergent, bread, turkey sandwich meal, cereal and buttermilk. This is the dry stuff. They wrapped the laundry detergent in a plastic bag. Ripe bananas (left) and Green bananas (right) (sold in packs of 5 bananas). These bananas were perfect with no bruises! Refrigerated good from Order #3. Yes, I like Fage and Siggi's yogurt! Order #3 Issue - Expiring buttermilk. I placed the order on January 9th, got it delivered on January 10th and the buttermilk had an expiration date of January 12th. If I were in the store, I wouldn't put this in my cart. I gave Amazon feedback about this (really, usually I'm not a big complainer, but since they are piloting this program...I thought they should know) and they credited back my buttermilk purchase and said they would contact the fulfillment center and have them check the expiration dates on the dairy products (the rest of the dairy (yogurt and cream) had fine expiration dates). And they gave me a $30 credit again (I told them they didn't need to do that, but I guess it's almost automatic since the wording was the same as the last email). So, there are many pros and cons of Amazon Fresh. If you order before 10 am, you can get delivery that night. Order by 10 pm and get it the next day. Awesome sauce. If you have mobility issues, this might save you a few steps of lugging stuff. If you live in an apartment on the 5th floor with no elevator, this would be great. No car? No problem with Amazon Fresh. Also, it seems you can have the groceries delivered to another address (in their service area) - this would be great if you want to buy groceries for your parents, relative or sick friend. Although I didn't take advantage of this, Amazon works with local merchants to offer their products. Angelenos will know Fugetsu-do mochi, Border Grill, Intelligentsia Coffee, Santa Monica Seafood and Valerie Confections. My two interactions were met with prompt replies. Going from $79/year to $299/year is a large jump. The price of food was pretty close to the grocery store. Some a little more, some a few cents less (you can go online and see the products yourself and compare). You can't use manufacturers coupons so if you are an extreme coupon contestant, this probably isn't the program for you (they do have some "online" coupons you can click on and use). I'm still going to Trader Joe's and I go to my local Farmer's Market on Saturday or Sunday. They have some organic produce, but they'll never match the freshness of a Farmer's Market - plus I like getting out, saying hi to the vendors, and getting a homemade pupusa along with some kettle corn too. Overall, I really like Amazon Fresh and I can see it working for a super busy family, people without a car (looking at you San Francisco friends), and many of my fellow Angelenos. I'm still deciding if I want to continue it for the additional fee. Of course, I'll continue regular Amazon Prime (I often wonder how people live without Amazon Prime), but we'll see if I continue the Fresh side of things...I have a few more days before my 30 day trial is over! Have you tried it? - There is no limit on the number of orders you can place per month with Amazon PrimeFresh. However, there is a $35 minimum grocery order on Amazon Fresh. (There isn't a limit on the number of packages you can order on Amazon Prime - geez, I totally take advantage of that when I order from Amazon way too frequently). - I didn't order many "fresh" items such as meat, seafood, or fruits and veggies. There are a couple reasons for that: 1) I don't cook much. I bake, but I don't cook much. Did you see all that yogurt I bought? The boxed Mac & Cheese? In my defense, I do fancy it up with some cold cuts or leftover chicken teriyaki and frozen corn - hey, it's practically gourmet. Most of my lunches are eaten out, and I sometimes find myself eating a sweet potato and fruit for dinner. Thus, I didn't buy the meats of a more typical family so I can't judge the quality of the meats from Amazon Fresh. 2) Farmer's Market & Trader Joe's - I usually hit TJ every other week, and go to the Farmer's Market once a week to pick up loads of fruits and veggies. - There is an App for Amazon Fresh so you can order on the go. I downloaded it for iPad and it was super easy to place the order. You can also build a cart anytime (say, as you run out of stuff) and then place the order when your cart is full, or you hit the $35 minimum. This was a great review and I was ready to sign up for the trial, unfortunately they currently do not deliver to my area. But this would be a great service to gift to parents with newborns. I saw these trucks when I was in LA recently. I would love to be able to have this service! We tried the 30-day free trial as well (in San Francisco) and just made the jump up to the full-on Prime/Fresh membership for one year. For us, it's been SO great and convenient. Grocery shopping usually happens on the weekend, so my husband and I would use (what little) time we spend together outside of work doing household chores, etc. The fact that we can order groceries whenever is AMAZING! We don't have a car since we're in the heart of downtown SF, so for us it just makes sense! I know it's definitely a "want" expense and not "need" but it's worth it to us for now! That was a great review. I wish they had this for San Diego. I have seen the trucks in/out of my neighborhood and always wondered if it was worth the investment. Your review was very helpful and I have a question regarding the membership - how often can you place an order? Rather, is there a limit of how many times you can have delivery per week/per month? I have a coupon burning a hole in my pocket, so your post is gratefully read and received.